Bet Dolphins +3.5 over Bears with Karamba. Bet Bears-Dolphins over 42 with 888Sport. The Bears hit the quarter pole of the season on a major upswing after a devastating opening night loss to Green Bay when Chicago coughed up a huge lead to the theatrics of Aaron Rodgers. But since then, it’s been a three-game winning streak going into last weekend’s bye. Chicago’s story starts on defense, and the addition of Khalil Mack has significantly upgraded and impacted what was already a solid group. Mack already leads the team with five sacks. The Bears are second in the NFL in both scoring defense and total defense with 16.2 points and 294.5 total yards allowed per contest. On the offensive side of the ball, quarterback Mitchell Trubisky had a breakout game last time out against Tampa Bay in a 48-10 rout. The sophomore became the first player in franchise history to toss five touchdowns in the first half and joined Sid Luckman and Johnny Lujack as the only QB to toss for six scores in a game. He’s racked up 945 yards with eight touchdown passes along with four interceptions for the season. Allen Robinson leads the receiving corps with 217 yards and a score. Jordan Howard leads the rushing attack with 281 yards for the year with a TD. The Fins went on the road to Cincinnati last Sunday, and after jumping out to 14-0 lead, saw it evaporate in the second half of a 27-17 defeat. Maybe most troubling was the Bengals putting 24 points up in the final quarter as the Miami D collapsed. Ryan Tannehill passed for 169 yards and Frank Gore carried the ball 12 times for 63 yards. Those numbers are going to have to go up, with additional contributions from others, against a hard-nosed Bears defense for Miami to have a shot Sunday at Hard Rock Stadium. After a promising 3-0 start, Miami is having some struggles getting things in sync on both sides of the ball. Chicago is relatively healthy, and the bye week should be beneficial for some minor aches and pains. Defensive back Prince Amukamara was out against Tampa Bay with a hamstring injury, but coach Matt Nagy is hopeful he’ll be back. Wide receiver Anthony Miller is questionable still suffering from a shoulder injury. Miami has some questions, starting with left tackle Laremy Tunsil, who may not be out of concussion protocol by Sunday’s game. Defensive end Cameron Wake “is not far off” from returning from a knee injury, according to coach Adam Gase. Wide receiver DeVante Parker has been hobbled and is questionable for Sunday. Karamba has the Bears as a 3.5-point favorite. Overlaying what happened the last time out for these two teams, it doesn’t seem like this one is going to be decided by a field goal and change. However, despite Chicago’s scoreboard eruption against Tampa Bay and Miami’s second-half meltdown against Cincinnati, there’s still reason to believe this one can be a lot closer than it may look on paper. 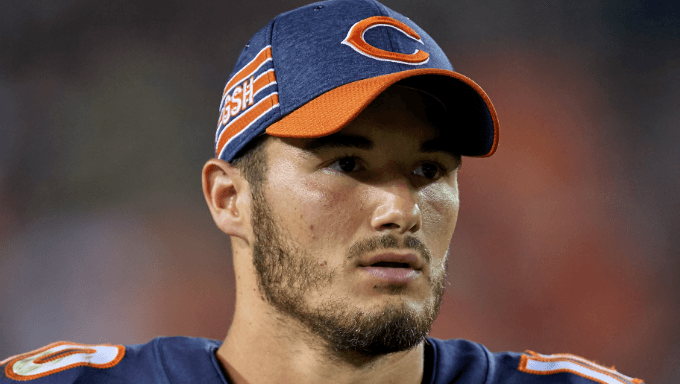 Trubisky is still very much a work in progress, and a second-year NFL quarterback even with potential and talent can be a rollercoaster ride. Consider his second game of the season against Seattle when he threw as many touchdowns as interceptions (2). The backfield of Howard and Tarik Cohen are at times explosive, but if Nagy falls too much in love with Trubisky’s arm and the ground game doesn’t get established early, the need for adjustments to the game plan will fall on Trubisky. Tannehill played horribly against Cincinnati. Now in his seventh season, more is expected from him at the position. However, what originally got Miami off to the undefeated 3-0 start was much better play from Tannehill, so he’s certainly capable, evidenced by his best performance so far this season in a 28-20 win over Oakland. He was 17-for-23 that day with three TDs. So while Chicago looks to be the clear favorite to win the game, there’s a gut feeling it will be relatively close. Bet Miami +3.5 with Karamba. The line is 42 at 888Sport, and again that could be obliterated if the Bears offense picks up where it left off against Tampa Bay. Miami’s defense isn’t as porous as their Florida neighbors, and they’ve picked off 10 passes this year. There will be at least one defensive TD from the Bears thrown into the mix, and Trubisky connecting with Robinson as well as tight end Trey Burton, who has a couple of scores this year, seems logical. Back over 42 with 888Sport.